Vole O'Speed: 'The Mayor's Vision': Can it work? I think we should not be co-operating with this project as the information with we have been supplied, particularly the presentation from last week's meeting at LCC, indicates that both the funding and the conception behind these routes is so calamitously inadequate to the task that they will be a total waste of time and money, and, worse, will attract inexperienced cyclists onto main road routes that have not been made any safer than they are now, with junctions that are still highly dangerous and unsuitable for all but the most skilled with-traffic cyclists. So there I am, four years ago, predicting that the Superhighways, in the form that they were proposed then, would lead to more cyclists on the roads, and more deaths. This was at a time when everybody else was saying that having more cyclists on the roads always lead to safer cycling. Of course, I was right. The original Superhighways concept was clearly "calamitously inadequate" because it failed to give cyclists their own space. The routes were envisaged as being superimposed, by and large, on bus lanes, and bus lanes that were mostly part-time, at that. So the cycle routes were full of buses to start with, at the best of times, and most of the time they were parked over. So this was clearly all just spin and blue paint: it was no real change to the conditions that cyclists endured already. And worst of all, of course, cyclists were being encouraged to cycle on routes with a number of particularly dangerous junctions that were hardly altered, or altered badly, for the Superhighway implementations. So we had the all too predictable tragedies at Bow. The pattern for the consultations on the Superhighways became clear shortly after I wrote that in August 2009. Long-winded CRISP (Cycle Route Implementations Study Plan) documents were put together by private consultants, often duplicating exactly work that had earlier been done on the LCN (pre-GLA establishment London Cycle Network) and LCN+ (Ken Livingstone's mayoralty) routes. LCC borough groups often dutifully co-operated with the compilation of these, attending CRIMs (Cycle Route Inspection Meetings) with the consultants, making their demands, which were in virtually all cases rejected in the CRISP reports as "conflicting with the maintenance of [motor traffic] capacity" or the "physical constraints of the roads". In other words, the consultation process with cyclists (or stakeholders as they were always called) was a farce and an insult. And even when the consultants did recommend significant change to junctions, their recommendations seemed to get ignored or watered-down in the actual implementation, most notoriously in the case of Bow roundabout, where what TfL built was not the signalised, off-cariageway route recommended by their consultants, Jacobs Babtie, but something fatally superficial that claimed two lives in quick succession in almost identical incidents. In north-west London, the A5 (Edgware Road) was originally proposed as a Cycle Superhighway, and I, with the local LCC groups, lobbied to get the Superhighway taken off that route, because (for one reason) we could see no way in which the Staples Corner West intersection (very similar to Bow roundabout) could be made safe using the methods TfL were wedded to at that time. Delving still further into the past, the LCN and LCN+ schemes were mostly conceived of as being on minor roads. But there were no answers to the simple observation that the minor roads are minor because, in general, they are not the most useful through-routes to anywhere that people need to go. Cycle route planning does need to start from the recognition that cyclists, or, should I say, people on bikes, are normal human beings who need to do the same things that everybody else needs to do: go to the same shops, schools, offices, stations, that are all linked, most usably and efficiently, by the main roads. Forcing an invariable, inevitable compromise between directness (and priority) and safety was never going to be a route to success. As I have said before, fundamentally, cyclists no more belong on the minor roads than do motor vehicles or pedestrains, and successful route planning in both the Netherlands and Denmark, to my knowledge, has been based on the procedure of looking first at where cyclists go already, and then providing saffe infrastructure for them in those places: quite the reverse of the LCN approach. The general failure of the LCN and LCN+ was compounded by the fact that the minor roads chosen were in general not made much nicer to cycle on than they had been before, because in few cases was much through motor traffic actually removed (rare exceptions to this, such as the route on King Henry's Road and Gloucester Avenue in Camden, and the route on Northchurch Road and Middleton Road in Islington and Hackney, did actually become quite successful), and by the fact that all the difficult junctions (Swiss Cottage being a classic case) into which the minor road routes inevitably discharged at some point, because they were minor road routes which do not fully run through, were left unsolved when the schemes were finally abandoned after Boris Johnson became mayor. Hundreds of thousands of people have discovered that their transport future is lying in their garage under a pile of disused barbecue equipment. Cycling will be treated not as niche, marginal, or an afterthought, but as what it is: an integral part of the transport network, with the capital spending, road space and traffic planners’ attention befitting that role. I today announce that the main cross-London physical legacy of the 2012 Olympic Games will be a proper network of cycle routes throughout the city, a substantial increase in cycling, and all the benefits – fitness, enjoyment and easy travel for millions, cleaner air and less traffic for all – that will follow. In urban transport, cycling is now at the cutting edge. Across the western world, from Paris to New York, from Edinburgh to Dublin, forward-thinking cities are investing hundreds of millions of pounds in the bicycle, knowing that well-designed schemes can deliver benefits far greater than their relatively modest costs. Because transport is not just how you get around. It is part of what shapes a city, for good and for ill. Cycling shapes a city – for all its people, cyclists or not – in ways that are almost always good. Pretty amazing to read. It's the new pragmatism around cycling, which Andrew Gilligan, the Mayor's Cycling Commissioner, was keen to emphasis at the launch of the strategy, pointing out that the case for an east-west cycle link (the "Crossrail for the Bike") was economic: it could take the equivalent of three extra trains per hour on the Central Line, at vastly less cost than any kind of tube upgrade. That's the point of view that it's always been my impression the Dutch principally had in developing their cycle networks; it wasn't about "being green", or doing anything for pollution or health, it was just sensible and economic: a very effective way of increasing mobility while reducing congestion and using available city space better, at low cost. It seems TfL have at last "got it". Hooray. But enough of the warm words: is the money enough to achieve the transformation Boris proposes? In round numbers, it's going to average £90m a year for 10 years, on current proposals. A future Mayor, of course, if Boris is not re-elected, or does not stand for election in 2016, could increase or decrease the allocation, or the London Assembly could change it with a two-thirds majority (as it tried to do last week). I've stated before that for the whole country, just to start getting cycle infrastructure up to a sensible standard, we need to be spending a billion a year. London has around 15% of the population of the UK, so we should be spending £150m a year just in London, which is about what the opposition parties in the Assembly tried to obtain last week. So this funding is not enough to cover what's needed for the whole of London. But, judiciously applied, it could make a big difference over much of the capital. And it does make sense to work from the centre outwards, from the areas currently that have the highest cycling levels, to build political momentum and minimise the objections. The funding is greatest in the first four years, then tapers off. Gilligan, one got the impression at the launch, was very much hoping that this would not be the final settlement, and that once the projects started to be seen to work, there would be public pressure for more, and it would become possible for a future mayor to increase the funding beyond current plans after the initial phase. We've got to start campaigning on this now, if the whole of London is to see a cycling revolution, that could spread to other parts of the UK. Cycling in Outer London is mostly low, with great potential for improvement. We will increase cycle spending specifically dedicated to Outer London from £3m to more than £100m. It's low all right. Around 0.5% of journeys to work in some wards of North Brent are by bike. And of school journeys across the whole of Brent, only 0.3% are by bike – shockingly few. And cycling has been flatlining, or on an actually downward trajectory in much of Outer London over the past decade, as census figures show. So there is a mountain to climb. All suburban boroughs will benefit from the increased investment in our Quietway and Superhighway programmes, both of which will extend far into Outer London. So I take it that that part, as it applies to Outer London, is extra to the £100m, which will be about £33m per chosen borough. Suppose in those chosen boroughs there are some really major infrastructural barriers, as we have in Brent, that will require major engineering to get high-quality cycle routes across them: like new bridges or underpasses for the North Circular Road, the West Coast Main Line, or the Metropolitan Line corridor. 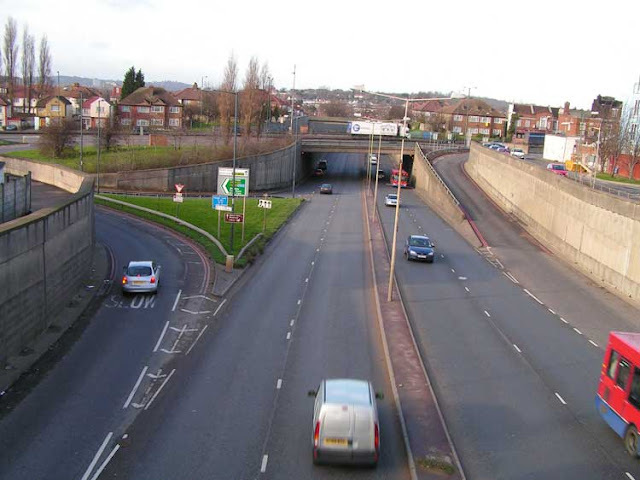 I can see those structures, and associated changes needed to the roads, easily coming to £5–10m each. Say you have three or four of them, as we would need in the Wembley to Neasden area of Brent to even start to create a satisfactory network there, that's going to eat up perhaps £20m of your £33m to start with. Then if you are creating fully segregated routes on main roads, that's easily going to cost £500,000 per mile, in complicated cases, which most will be, including the junction and signal changes needed. So you are not going to get many miles of cycle route within these budgets. I'm not trying to be pessimistic, I'm trying my best to estimate the real problems here. It is possible that with the larger scale of planning and procurement that the new investment will bring about, costs for the individual infrastructure elements will be reduced to lower levels that they have been at in the past, when things were all done as a one-off (as when it cost Camden £1 million for 1 km of the Royal Colllege Street segregated track in 2000). Cycle bridges could be made to a standard pattern, for instance, reproduced in several locations. Bureaucratic costs, such as those associated with Traffic Orders, are also reduced when bigger projects are carried out. But the costs of solving the problems of the existing layouts in Outer London are not to be underestimated by any means. 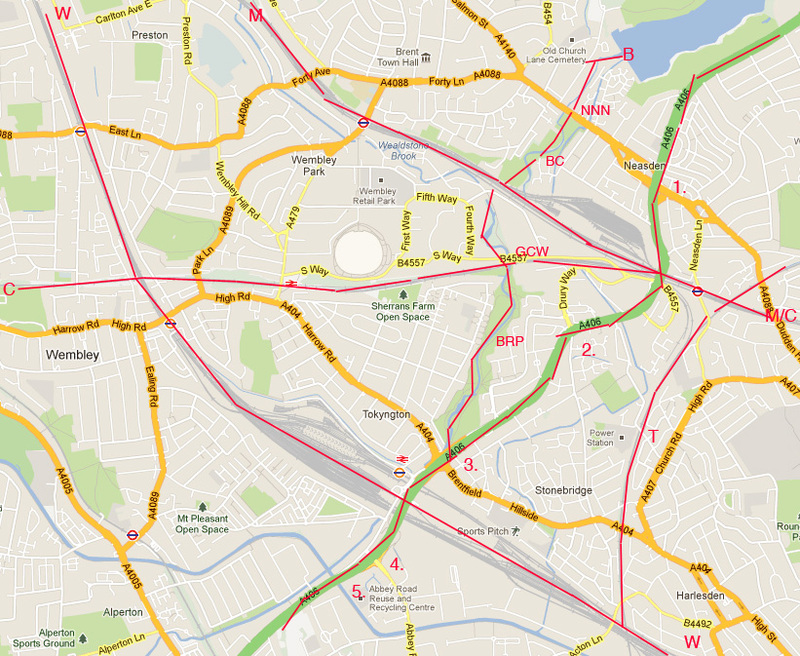 Here (above) is a rough-and-ready attempt to illustrate these barrier problems in the Wembley to Neasden area of Brent. Wembley Stadium is the white oval slightly left of centre. For scale, the stadium is 300m wide. I've put red lines on all the railways which have no minor road crossings: that is, they are only crossed by busy A and B roads with only one lane in either direction on the bridges, making them all nasty, hostile pinch points for cycling. There's only one exception to this rule I can see in this area, the tiny Taylor's Lane going under the North London freight line in Harleseden, marked with a T. This does not create a particularly useful route, because that road soon hits the North Circular, the A406. The railway crossing points in the map above all (with the exception of the six-lane North Circular) look pretty much like this: East Lane at North Wembley Station. Note how long some of the distances are between crossing points of the railways. Along the Metropolitan line corridor (marked M), it's about 1.5km from the A406 (not really a cycleable crossing for those without a death wish) to Bridge road at Wembley Park; along the Chiltern Line (marked C) it's a similar distance between Great Central Way (another nasty narrow uphill road full of lorries heading for the Wembley Park industrial estate) and the A479 Wembley Hill Road; it's a very slightly shorter distance along the West Coast Main Line (W) between the A406 at Stonebridge (where there is a kind of a cycle road) and the A404 Wembley High Road. The Grand Union Canal aqueduct, by far the nicest crossing, and a lovely piece of engineering, where the canal passes over the A406. 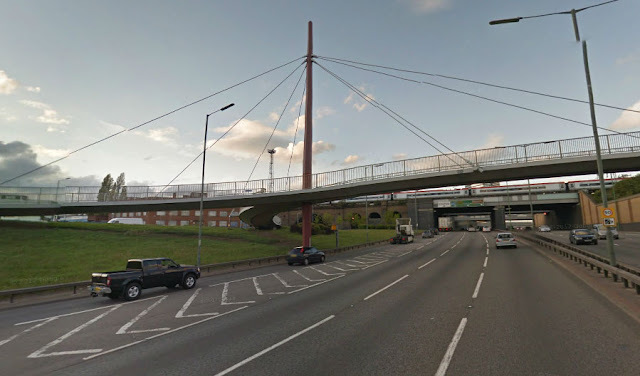 Could be Holland with left-had driving: the Stonebridge cycle bridge across the A406. Unfortunately, it doesn't connect to a viable cycle network. The last red line on the map is the River Brent (B). I've included this tiny stream as a barrier because, strangely, it is, in the stretch between the reservoir and the A406 and West Coast Main Line nexus. It is crossed only at the very hostile Neaden Lane North (NNN), at an obscure and tiny path at Bridge Close (BC) which takes a lot of negotiating on a bike, at the aforementioned, horrible, Great Central Way (GCW), and then on a couple of bridges in the linear Brent River Park, which, to their credit, the borough has improved in recent years. So the important point about the geography of Wembley and Neasden that I am pointing out is that there are no possible minor road routes to anywhere of any use. The Quietways concept expounded in the Mayor's Vision is not going to work here without some real new building. The only places routes could go at the moment would be the main roads, where full segregation would be needed to make the cycling experience attractive, and there is actually not even much space for that at many of the pinch-points. There is no grid of streets here that can be converted, say in the way that the street grids in Bloomsbury and Hackney can, and in many places, have been, converted, so that cyclists have a defined route through side-streets with mode-filters (road closures allowing cyclists through), while other roads in the grid are left open to take the through motor traffic. The pattern of development in Brent and many other places in Outer London is the "broccoli" style. The railways were built before the suburbs were built-up, and only allowed crossings at infrequently-spaced main roads. Infill development in the broccoli style later occurred, closing up the gaps and making it mostly impossible to build new crossings because the housing or industrial development became continuous. It was all rather badly-planned, and now we're stuck with it. The only real solution is to take every opportunity where redevelopment occurs (as it will in Wembley Park) to build new connections, and, in many places, public land acquisition will be necessary, and extensive rebuilding. This will be expensive, hence my calulations above for what facilities the Mayor's new money is likely to be able to buy in this sort of area. I'm labouring this point, even to the extent of drawing a scrappy map, because it's my experience that these problems in Outer London are often not understood, not only by policy-makers, but also by campaigners in less problematic areas, who've got hold of some over-simple ideas as to what measures might be necessary to create a quality cycle network in an old urban environment. Such problems are not unique to Brent; one can find areas of East and South London where they apply similarly, though I am not convinced that there is any other case quite so bad, from the severance point of view, as mid-Brent, though someone could try to convince me otherwise. Clearly, the money on offer currently for Outer London isn't going to go far in doing this, which is why there is the sensible idea in the Vision of concentrating investment in only three demonstration areas (though how large these areas will be is not made clear). It would seem sensible, even so, for the chosen boroughs to try to augment this new money with funds from other sources, such as the Community Infrastructure Levy on new developments (a partial replacement for the old Section 106 funding schemes), and the public health budgets for which they are now responsible, if they wish to make the most of this "Little Hollands" concept. With the boroughs’ agreement, we will seek to open up a number of central one-way streets for two-way cycling, creating direct, easy, lower-traffic routes through the City and West End. Experience from the City and Kensington and Chelsea, who have brilliantly led this process, shows that it can be accomplished without traffic or safety impacts. I feel this is a pragmatic formulation to avoid "frightening the horses" of Westminster Council and the City Corporation. It would be a step forward from what we have, but on some busy routes it may become apparent that it is not enough, that contraflow cycling simply proves to be unsafe when squeezed between double rows of parked cars and a heavy traffic flow, and I'm not sure what will happen then. It's a reasonable enough formulation for truly quiet streets, of which there are some in the West End and City. Our policies will help all Londoners, whether or not they have any intention of getting on a bicycle. Our new bike routes are a step towards the Mayor’s vision of a ‘village in the city’, creating green corridors, even linear parks, with more tree-planting, more space for pedestrians and less traffic. But what will actually happen in less enlightened (mostly Outer London) boroughs when push comes to shove on the Quietway programme, when, to create these quiet routes, rat-run roads actually need closing to motor traffic? I am reminded, by a recent post about rat-running by The Alternative Department for Transport, of conversations I have had with officers in Brent (not one of the most anti-cycling boroughs), relating to roads in the south of the borough (the easier part to make cycle-friendly), who still really do feel that it is a legitimate function of minor residential streets to be taking some of the motor traffic pressure off the main roads, and that closing rat-runs is neither politically nor practically possible. There's going to have to be a sea-change in attitudes here, amongst councillors and officers, to make the Quietways work. Overall, the Quietways are the aspect of the Vision I am least sanguine about. I feel this project could easily run into the same political quicksand that the LCN and putative Sustrans networks did, without very determined leadership from the Mayor and the Cycling Commissioner. Boris cycling plan. 9 out of 10 for vision. 5 of 10 content. Best bit-the quietways. Worst-lack of commitment to sorting one-way systems. Boris cycling plan. Reasonable grasp of Hackney philosophy. Segregation generally not practicable, will go same way as LCN -into sand. How many miles of trip hazards is Boris going to install. I'm sure Hackney will continue to focus on what's important for cycling and peds. Hackney has also reinvented its public realm, its streets and public places. At least ten years of consistent and high levels of investment from the local authority has built on congestion charging and has changed the borough's streets out of all recognition. There have been numerous complementary, 'soft' measures, to promote cycling and walking. There has been major and very subtle changes to street design and there has been a supportive town planning regime - most new housing development in Hackney is car free or car capped. Hackney's approach is essentially simple and takes much from the work of Danish urbanist Jan Gehl. Hackney has seen an incremental change on its streets to: create a better balance between pedestrians, cyclists and motor vehicles. There has been an equality of esteem for both movement and, crucially, urban design. Almost every intervention on Hackney's streets has improved its public realm and benefitted both cyclists and pedestrians. In Hackney we think about cycle journeys, not cycle routes. This is all great, but I'm sorry to say, Hackney ain't the Netherlands. Or even Copenhagen. There are some good cycle routes and good spaces for cycling in Hackney (particularly Victoria Park), and some limited pleasant cycling experiences are possible in Hackney, but Hackney's main roads, that of course you cannot avoid for most practical journeys, are hell to cycle on, they are no better than Brent's, and they cripple cycling in the borough and will continue to limit it to a very small subset of the population until continental segregation methods are adopted on them. It is a telling fact that, in Hackney, only 3% of children cycle to school, whereas 33% want to. That's ten times better than Brent's 0.3%, but it's twenty times worse than Amsterdam's school cycling rate, and that's only half the Dutch average of 89%. By those standards it's pathetic, and represents a total failure to make the borough truly cycle-friendly, as children (along with old people) must be regarded as the "canaries in the mine" for a really breathable cycling atmosphere, not the hipsters on their fixie bikes around Broadway Market. So I think Cllr Stops should stop lecturing us, in other boroughs, about what cycle-friendly policies actually look like, and engage with the new agenda for truly inclusive cycling being propounded in the Mayor's Vision. The essence of this Vision is around the recognition that cyclists need segregation on main roads. The kind of thing that Cllr. Stops seems to think everyone will trip over. I've been on about segregation for years, decades indeed, of course, boring people to death about it. Because (not to go over all the old stuff again), though I am fully aware that the successful continental cycling policy approaches include many other elements, including filtered permeability, 20mph (and slower) zones, bicycle streets, quality universal cycle training, and all the rest of it, I have constantly held the segregation on main roads to be the keystone of the arch, without which all other measures intended to create mass cycling will always fail, and that the substantive absence of this measure in the British environment was the essential explanation of the failure of all past political attempts to revive cycling in this country. This demand for segregation on main roads, that the membership of LCC voted overwhelmingly for, was the origin of the LCC's Go Dutch campaign, and though the campaign became wider, was always at its heart. When the London Assembly Transport Committee held its enquiry into cycling safety, all the "expert" organisations asked to contribute, from the cycling side, the LCC, CTC, Cycling Embassy of Great Britain, and British Cycling, all were unanimous that cyclists need segregating from fast and heavy traffic on the roads. The point was emphatically made in the committee's report, as it had to be, with the observation that the efforts of Transport for London thus far to engineer a "cycling revolution" in London had missed out this critical detail. This criticism I believe had an effect on the Mayor and TfL, and in the Vision we see the result. The Vision mentions "segregation" 12 times and "segregated" 23 times, and those words were constantly mentioned by those presenting the strategy at its launch. A segregated "Crossrail for the Bike", segregated Superhighways and other segregated sections, as parts of the Central London Grid of routes and of the Quietways, are all now promised. The cover of the Vision document portrays the projected segregated route along the Embankment, and Camden's segregated Royal College Street (which was independent of the Mayor's plans), and the segregated proposed CS2 extension, form the first infrastructure illustrations in the body of the document. For decades it was almost impossible to mention segregation in the world of UK cycle campaigning. It was "too controversial". It stirred people up too much. The word had to be avoided, on pain of ostracism. People searched for other ways to same the same thing: they talked of "separated", or "dedicated" infrastructure. They had to tiptoe around the linguistics. LCC's Campaigns Committee came up with the strange, fudged wording of "clear space for cycling on main roads" to cover the concept, without specifying it properly, when the options for the policy vote, that eventually led to the Go Dutch campaign, were decided upon. This is baffling. Shared cycle and bus lanes are possible, if they are wide enough for buses to overtake bikes with good clearance, but if they are not wide enough, separating them off by the means stated would be a disaster, as cyclists and buses would not be able to get past one another, and the result would be frustration for bus passengers and intimidation for cyclists. The real point about the interaction of buses and cyclists is they must not cross over at the stops; the bikes must always be able to undertake at the stops, whatever the arrangement on the links. This is the only way to prevent conflict and furstration in the relationsahip between buses and bikes, because the two go at about the same average speed, but cyclists need to keep their momentum up to be efficient, while buses need to keep stopping. We must keep a consistent principle of cyclists being to the left of buses, as they do in the Netherlands (where it is to the right, obviously), whether the lanes are shared or separated. 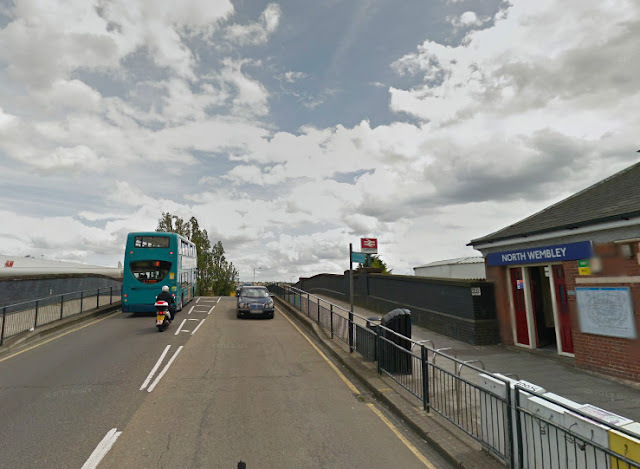 We have examples of the undertaking at stops arrangement already in London, for example at Royal College Street, and even at obscure places (but known to me) in the suburbs, like Kingsbury Road, Brent, and Imperial Drive, Harrow. The idea has not proved problematic wherever it has been tried, and TfL are now proposing it (in places) on Superhighway 2 in Stratford. This trend must spread, and it must become the default procedure. 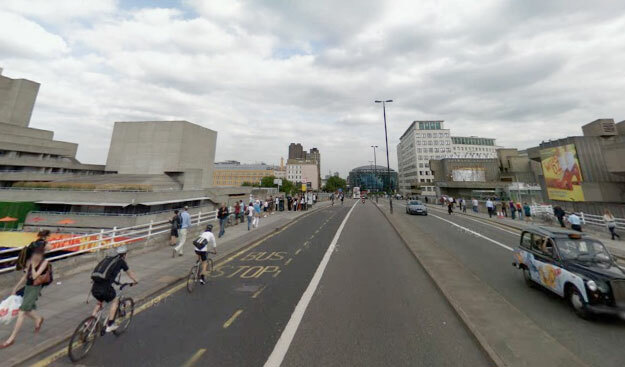 The Waterloo Bridge bus and cycle lane is wide enough for both, and there would be no advantage, and considerable disadvantages, to segregating it off. But it fails at the stops, where cyclists have to pull out into a fast lane of traffic. Two-track, or multi-track, planning for cycling leads to indirect, obstructed, impractical routes for "beginners" that will put them off cycling, and, on the other side, unsafe provision for "confident cyclists". It simply has no role in the Dutch approach to cycle provision. The Dutch build everything up to a common standard, a standard equally suited to use by a 7-year old child and by a 60-year old veteran racing cyclist. There are no routes for "beginners" (though there are extra fast routes, as Bicycledutch tell us). I don't wish to harp on too much about this, as other phrases in the Vision suggest that the lessons of the compromised route planning of cycle networks in London of the past have been learned. But I think we will have to be very vigilant about the whole Quietways concept implementation. Whereas Cllr Stops thinks the Quietways are the best part of the vision, I think they are the most dubious, having most potential to go wrong again, and to me the talk of "routes suited to beginners" and "grading" is the most worrying part of the whole Vision. But I may be over-analysing a few words here. What seems to have least potential to go wrong is the headline project, the "Crossrail for the Bike", on the north bank of the Thames. This is very largely under the control of TfL, and I see no reason why they can't get on with it rapidly, and finish it in under two years to a high standard. Certainly Boris stands to benefit enormously from seeing such a high-profile facility built quickly and efficiently. The Superhighway programme, currently limping along painfully slowly, needs to be accelerated, along with having its standards radically raised, as the Vision promises, otherwise it continues to have the potential to embarrass Boris. With the co-operation of Camden and Islington (very likely), and Westminster and the City (more dubious), good progress should also be possible on the Central London Bike Grid in a couple of years. I am worried, with As Easy As Riding a Bike, about the lack of detail in the Vision as to how junctions on the various networks will be managed. This is one area on which campaigners will need to keep the closest eye. But this essay has gone on far too long already, so I'll not get into junctions now. I also wonder whether putting part of the "Crossrail" route on the elevated Westway can actually work. I have my doubts; it's politically daring, but it doesn't sound like it will make for an attractive cycling experience. But I'll have to leave that for now as well. When I first saw the headlines in the Vision I was 95% optimistic about it. Now, having read and thought about the detail, and having seen everybody else's thoughts, I am about 75% optimistic. Yes, we know that paths of the standard of what is proposed on the Embankment already go everywhere in the Netherlands. So, David Hembrow implies, what's so great to make a song and dance about here? But they don't in the UK. That's the point. We have to start. A start in the very heart of London is quite momentous. I welcome the start, and I welcome the transformed language, and apparently transformed ambition, of the Mayor's Vision. I'll be the first, or one of the first, for there are many eagle, critical eyes in the London cycling community, to find fault with the implementation of the Vision, to criticise any backsliding in the ambition, and to attack any attempt to conceal, mislead, or pull the wool over our eyes over funding, or push hype over substance and claim as adequate standards when better should have been achieved. It could all go wrong, and we could be back much were we are now in ten years' time. But I don't think so, not this time. In the past, as I said at the start, the vision was fundamentally, obviously flawed from the first. This time it is not. It could just work this time. It's now down to everybody, everybody in the entire city of Greater London, to make it work. The people of this city deserve it. Great analysis. I share your fear that Westminster are going to destroy implementation. The main reason the term 'segregation' has been controversial is because it implies that once a cycle path has been provided, cycles will be prohibited from riding elsewhere on the carriageway. Segregation echoes the racial segregation in pre-civil rights era United States or apartheid South Africa. Of course, if the segregated facility is good, prohibition from the main carriageway is irrelevant. And as Hembrow argues, why would Dutch cyclists even want to ride on the road when they have such wide, smooth, direct and safe cycle paths? Even so, better terms, less loaded with unfortunate historical baggage, are *protected* and *prioritised* routes for cycling. It steers clear of the integration/segregation dichotomy and does a better job of identifying the practical benefits of this kind of cycling infrastructure. I disagree. "Segregation" is the clear engineering term to describe what I am talking about. It is the correct term. The fact that the word has been used to in connection with racial segregation is irrelevant, and should no more prevent us from using it correctly in a traffic engineering context than physicists should be prevented from using the word "colour" to talk about light, just because "colour" has been used as a perforative racial term. In fact, I've hardly ever heard the term "segregation" used in the UK in a racial context, and I really can't see this problem. The term "protected" is not too bad, but "prioritised" risks being misinterpreted as just weak measures like cycle logos on a carriageway. As for prohibition from the carriageway, I am quite clear that I have no problem whatever with prohibition of cyclists from motor roads in the circumstances in which the Dutch do it. It is sensible, it is connected with sustainable safety, and if we had the same cycling infrastructure in the UK, it would be desirable in the same contexts here as well. We already have the prohibition from motorways, just not the high-quality cycling alternatives. Thing is, segregation implies that the cyclists are being shunted away into their own sections of the road. I'd rather see motor cars segregated away from cyclists and pedestrians. Do you also talk about segregated lanes for motor traffic? Is that correct usage? Who is being segregated from whom, for whose benefit? These things matter. Priorisation is not a soft measure if it's a row of bollards that prevents a car passing through a junction but allows cyclists and people on foot to do so. Is that those segregated facilities? Who's being segregated? I think it is helpful to think of it as "cars being segregated away from people on bikes and on foot". That's how the Dutch system feels. It doesn't feel there as if the segregation is any kind of restriction for cyclists. Quite the reverse. I was speaking to an old-time cycle campaigner this week who thinks like this. He always feels segregation restricts his cycling. But that's symptomatic of it being designed badly. For me, and I think 99% of people, what restricts their cycling is not being segregated, but having to compete with fast, powerful vehicles, often overtaking aggressively with inches to spare. That's the real restriction on cycling space, in my view. Quality segregation guarantees the space in which cycling can grow. For whose benefit is it? I discussed this at length in a previous post. I think everybody benefits, except those who think they should be able to drive wherever they like. And I expect even most of them could be brought to see the benefits of a more rational system as it develops. That's the message of the way the Dutch have changed their transport system. Yes, a row of bollards that prevents a car passing through a junction is a kind of segregation. It's what David Hembrow calls "segregation without cycle paths". It's a matter of what is appropriate and can be made to work on different types of roads and in different places. This can't be done everywhere. We can't eliminate cars from all roads so we need a variety of means to regulate the way the spaces are used. On many critical roads in London we need cycle tracks to complete the connections, as the Mayor's Vision acknowledges. With respect to Councillor Stops, I noticed the blog post you quote shortly after it was published. I tried to leave a polite comment correcting some of the misconceptions in the piece, but it looks like the comment has been moderated into oblivion (along with any other potential comments on the post). It gives me the impression that Councillor Stops is something of a zealot and not worth wasting time trying to engage with.